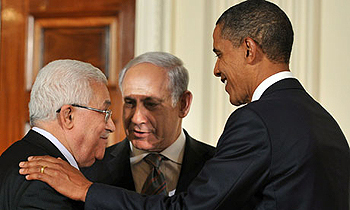 (L to R) President of the Palestinian National Authority Mahmoud Abbas, Israeli Prime Minister Benjamin Netanyahu and U.S. President Barack Obama. Israeli Prime Minister Netanyahu says the objective of a two-state resolve is finding "a new path to achieve a common goal, which is to get a framework agreement for peace that will ensure both peace and security." To date, most common goals of state security in the Middle East have required an enemy against which cohesion forms. The current preferences are the Iranian and Israeli theocracies—both of which, however, are two sides of the standard framework of security rationale. From the international to the state level, the strategic framework of common defense is applied within the state system for determining security and peace, especially in the Middle East. Its efficacy is in question. Warfare, terrorism and uncontrolled defense still bedevil the region. Regardless of rising planetary issues of all-inclusive insecurity, state security is still reasoned primarily in terms of its immediate terrain rather than according to global imperatives. So heavily emphasised is state defense in the security rationale that the industry is now beyond any one state's ability to control it. At the same time, political divisions have proliferated within the state with trans-border defense affiliations that state borders can't control, despite their massive defense. Overwhelming defense has become a byword for security. Why? Fighting forces not only transcend state borders in the Middle East, but collective security arrangements basically arise through strategic defense fronts. Systemic accord between states for geopolitical authority hasn't developed through the strategic framework of security rationale. With Iran, Israel or al-Qaeda as the fulcrum around which intra-state security deals revolve, the Iranian nuclear issue is rising, trans-border militant divisions are compounding, and the Israeli-Palestinian resolve is up in the air, still. Facts on the bombed-out terrain of Afghanistan are consistently stark. Predicating state security on military victories has become a dynamic manifesting division, danger and defense instead of political cohesion. "Victory" in Afghanistan appears a misnomer of cause via the marginalization and militarization of Afghan society. Training Afghans to fight Afghans hasn't produced general political stability. The terrain is desolate. In light of the International Security Assistance Force's current situation in Afghanistan, many are now questioning NATO's logic. Their latest plan for a regional defense shield could augur a nuclear arms race and nuclear war rather than general security. Given that the NATO agreement is strategically orientated and derives through the prevailing framework of security rationale, it would be based on a division within the state system for its defensive validity. As Behzad Khoshandam notes in Iran View, "French President Sarkozy suggests it's to confront what NATO and the West perceive as the Iran threat. ... NATO is apparently still following the Cold War logic of a defensive threat for its approach to security. Iran subsequently considers the missile shield a threat to its national security, which is also based on defense." So the question is, does the Israeli prime minister's new framework for security amount to predicating a Palestinian state on common animus against Iran? Since statehood, Israel has consistently resisted across-the-board defense regulation, especially on nuclear arsenal, for security in the region. Preferring instead to actively apply the strategic framework of defense through U.S. support, Israeli defense capabilities have subsequently burgeoned along with military interventions and warfare in the Middle East. This being the case, the prime minister's desire for a new framework of security agreements could in all reality be another version of the problematic current one. For better or worse, the United Nations is still the predominant security framework of the international system. So entrenched has it become in the Middle East, many regimes now rely on its direction of power. Saudi Arabia appears to be one. According to Lamis Andoni in Al Jazeera, some Arab leaders want to denuclearize Iran, in fear of the public backlash should Iran as a Shi'ite theocracy be so empowered. It's all par for the course, subject as they are to greater defense initiatives. The broader worry of a nuclear Iran causing internal dissent logically comes down to Iran's role in countering Judaic Israel and the bilateral alliance it embodies with the United States. And so it goes with this framework of security. It is division all the way unto the realms of global balance of power arrangements. Little wonder many are questioning the Wikileaks revelations. Will Arab leaders now coalesce with Israel against Iran? Either way nobody wins. Every war defense industry and the dynamic of division have produced insecurity. Hezbollah, for example, now have 50,000 rockets and missiles, 40 to 50 Fateh-110 missiles, 10 Scud-D missiles. The Pentagon thinks that's enough for a regional war. Logically the current framework of rationale would validate it for demilitarization rather than all-inclusive defense regulation. The divisions of defense preclude systemic rationale. Full, frank and open debate—democratic rationale, between the nuclear powers of the U.N. Security Council—has been subverted by such battles into the covert intelligence of command structures, rendering military regimes incapable of realizing systemic legislative authority beyond the continental shelf if not the state border. Nothing exemplifies this more than IAEA discord on nuclear arsenal within the state system. From the U.N. to the superpower, defense regulators don't apparently recognize the broader insecurity their strategy is fomenting. Military interventions, surgical strikes on nuclear sites, balance-of-power arrangements, and U.N. inspections have all failed to halt the proliferation of weapons around the globe. State legislators don't accept that we need less rather than more border defense for general security. "No one believes a strike on Iran would eliminate its nuclear facilities," says the analyst M.J. Rosenberg. "It would also vastly increase the threat of terrorism against American civilians at home and abroad. It could even trigger a regional war." Adm. Mike Mullen, chairman of the Joint Chiefs of Staff sees it differently. "The United States takes very seriously our security commitments in the Gulf region," he says regarding the massive U.S. Naval base in Bahrain now on the frontline of any war with Iran. So does Israel, just like Iran. These ancient fonts of civilization not only prize their territorial security, but in defense of it assert territorial superiority. Is America any different? Military drills along the Persian Gulf by Iran, war games in the Pacific by superpowers, North and South Korean rocket launches—all these take place to assert an ability to defend nuclear sites from each other in a world critically in need of cohesion. Can the world handle such territorial defense any longer without a new framework of security in this region?